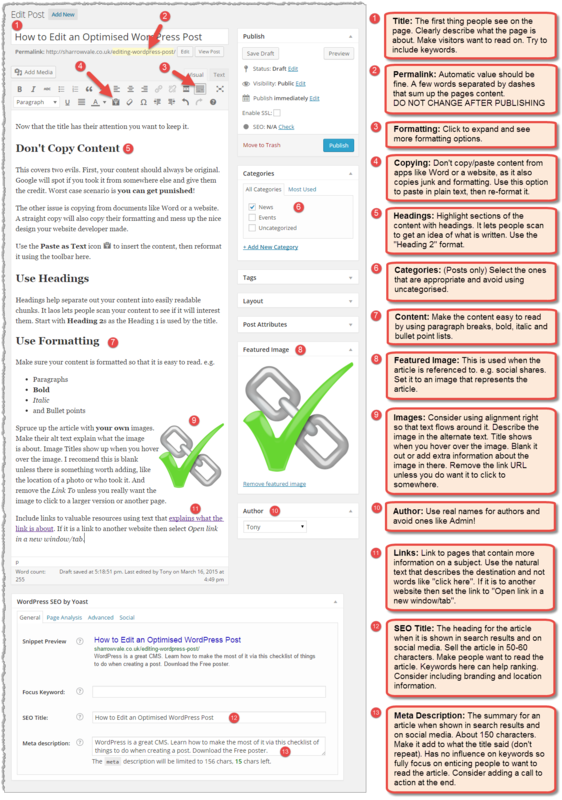 This is a guide and a reminder of the tasks you should perform when adding or editing a WordPress Post or Page. This not only helps your WordPress SEO but it is also designed to help you write more readable content. You can Download a Printable PDF version and keep it by your computer while editing. This is the first thing people see on the page. So clearly describe what the page is about. Make your visitors want to read on. Try to include keywords. The automatic value should be fine but you can edit it on first creating the post. A few words separated by dashes that sum up the pages content is best. Click on the "kitchen sink" icon to expand and see more formatting options. Don't copy/paste content from apps like Word or a website as it also copies junk and their formatting. Use the "paste as text" icon to paste in plain text, then re-format it using the options in the toolbar. Highlight sections of the content with headings. It lets people scan to get an idea of what is written. Use the "Heading 2" format for your main headings as the title has already used "Heading 1". For sub headings use "Heading 3" etc. This applies to Posts only. Select the ones that are appropriate and avoid using uncategorised. Make the content easy to read by using formatting options such as paragraph breaks, bold, italic and bullet point lists. Also make sure your content is your own. If you copy content from others don't expect to rank well in the search engines. Consider using alignment right so that text flows around it. Describe the image in the alternate text as this helps visually impaired people and Google understand what the image is about. The Title shows when you hover over the image. Blank it out or add extra information about the image in there. Maybe where a photo was taken, who is in it or who took it. Remove the link URL unless you really want it to click to somewhere. People what to know who wrote the post. Use real names for authors and avoid ones like Admin! Link to pages that contain more information on a subject. Use the natural text that describes the destination and not words like "click here". If it is to another website then set the link to "Open link in a new window/tab". This requires the use of WordPress SEO by Yoast . This is the heading for the article when it is shown in search results and on social media. Sell the article in around 50-60 characters. Make people want to read the article. Keywords here can help ranking to try and include them but don't compromise on readability. Consider also including branding or location information. This website contains it's own Search Result Emulator which is slightly more accurate than the one used by Yoast. I have also written articles about how to write great SEO Titles and Meta Descriptions so that they work for search engines and attract visitors to your website. This is the summary for an article when shown in search results and on social media. Google shows about 150 characters. Make it add to what the title said (don't repeat). It has no influence on keywords so fully focus on enticing people to want to read the article. Consider adding a call to action at the end.